Selling a nice smooth 70's melos/univibe phaser - save postage and bid from sheffield! Mate of Mines selling a Cornell Romany Plus combo, all valve handmade 10 watts switchable to 1.5., reverb, home use only, never gigged, with deluxe cover. very very nice amp. they cost around £1100 new, he's asking £650 for it. drop me a pm if anyones interested and i'll pass on the details. Flogging my old '83 Westone Thunder. Gave it a bit of an overhaul: stripped the body and re-varnished/filled a few dings, put in new pots and caps and an Irongear Steamhammer in the bridge and one of their Rolling mills in the neck. Also has new non standard vol/tone knobs. Don't really wanna sell but need new hardware for long standing tele project. Beautiful clean sounds when using the coil tap but dirty's up nice. Reet,I'm Selling my Epiphone Popa Chubby flying V if anyones interested, it's a Korina V but with Seymour Duncan P90's and a Tortie pickguard, bought it new in 2003, epiphone only made these between 2001 and 2003 for brooklyn guitar slinger Popa Chubby. (check him on youtube!) making it quite a rare beast. it's in excellent condition, hardly gigged, fitted witha set of 10's and a medium action, the P...90's add more of a growl to the usual humbuckers that are on V's, and it gives it a darker tone. I've had the pots changed as they were a bit crackly, if i remember right i had them changed to 500k too, also changed the original black knobs to gold ones as one of them broke., the guitar also comes with a brown gibson style hard case with very eye catching pink plush lining. I'm gonna be putting it on ebay very soon, theres one on at the mo with a starting bid of £320 without case, i'll accept £300 or very nearest offer for a quick sale. not seem many of these for sale in a long while making it quite a collectors piece. Geniune reason for sale is that i'm after a Jazzmaster, i'm more of a Fender / Gretsch man and the V unfortunately has taken second place over the last few years. Drop me a message if anyones interested!! flying v is now on ebay. Post subject: Bits For Sale. Got some guitar bits for sale due to swapping and changing. I'm up for offers and trades for bits of interest. All of these are based in West Yorkshire, and happy for people to come and look. 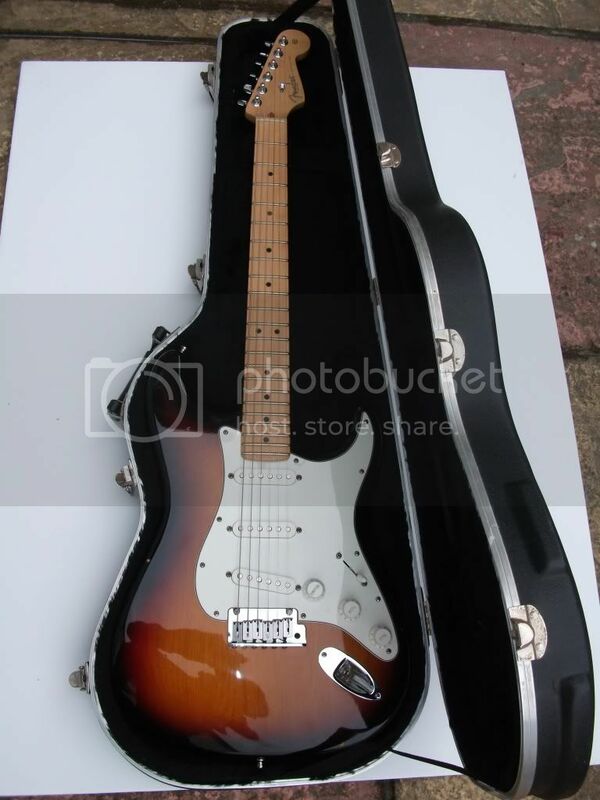 Fender USA Strat - Early Highway 1? Small headstock, Vintage bridge etc. Nice Hendrix tone. Minor belt wear on back. Guitar is Honey Blonde type colour. £600 ono. Epiphone Les Paul 1959 Re-issue - Ltd Ed. of 1,959 tributes to the legendary guitar. In traditional Cherry Sunburst. Great guitar, never been played. With case and certificate of Authenticity... OFFERS. All in sunny West Yorkshire. Decided to flog my 2000 Fender USA Strat Standard. Its relatively clean, but has got a few little dents and scratches. I've had it for around 6 months and never gigged it, but I'm pretty sure the previous owner did. All the bits are standard, I've replaced nowt. Hard case is included. Its got a great action and a really fast neck, minimal fret wear, lovely to play, the only problem is I find it a bit boring! I'm currently building a partscaster from an ash body, Duncans and big 70's style neck - so the standard will become even less played that it is now. I'd like around £520 for it. I've also put this on e-bay. I'm also interested in folks who might want to do a swap for this guitar, maybe a clean Epi Casino, Sheraton, Mexican Jazzmaster/Jag, Gretsch style or any other 'interesting' guitar, or maybe Guitar + effects/and or amp etc. I'm open to offers - just fancy a bit of a change! Does anyone have an ashtray bridge for a telecaster they'd like to flog me? This Amp is just over a year old, ive never gigged it, and it is in "As New" condition, it was £599 new I am after £300 - it really is a superb Amp, I don't really want to sell it, but I want to fund some effects pedals. This has to stop, right now. A fresh build copy of a Trainwreck Liverpool 30-35 watt amp by Gallo Amplification of Sheffield, with variable voltage regulator made by Gallo Amplification of Sheffield. All valve, point to point wired, Heyboer and Edcore accurate transformers from USA, can be wired for 110 or 220v, Russian military spec power valves, solid bubinga head cabinet. As used by Warren Haynes and Brad Paisley. I'm selling my 2008 Ibanez Jem7 Vwh. Lovely guitar, set up well, and plays like a dream, it's just doesn't suit my style of playing really! If anyone is into shredding or fancy lead play they'd love it. Looking for £1100 Ono, plenty of pics etc if anyone is interested, also on eBay, item 161791162879 if you want to have a look.